Cupressaceae is a conifer family, the cypress family, with worldwide distribution. The family includes 27–30 genera (17 monotypic), which include the junipers and redwoods, with about 130–140 species in total. They are monoecious, subdioecious or (rarely) dioecious trees and shrubs up to 116 m (381 ft) tall. The bark of mature trees is commonly orange- to red- brown and of stringy texture, often flaking or peeling in vertical strips, but smooth, scaly or hard and square-cracked in some species. 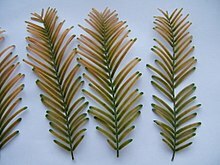 The leaves are arranged either spirally, in decussate pairs (opposite pairs, each pair at 90° to the previous pair) or in decussate whorls of three or four, depending on the genus. On young plants, the leaves are needle-like, becoming small and scale-like on mature plants of many genera; some genera and species retain needle-like leaves throughout their lives. Old leaves are mostly not shed individually, but in small sprays of foliage (cladoptosis); exceptions are leaves on the shoots that develop into branches. These leaves eventually fall off individually when the bark starts to flake. Most are evergreen with the leaves persisting 2–10 years, but three genera (Glyptostrobus, Metasequoia and Taxodium) are deciduous or include deciduous species. The seed cones are either woody, leathery, or (in Juniperus) berry-like and fleshy, with one to several ovules per scale. The bract scale and ovuliferous scale are fused together except at the apex, where the bract scale is often visible as a short spine (often called an umbo) on the ovuliferous scale. As with the foliage, the cone scales are arranged spirally, decussate (opposite) or whorled, depending on the genus. The seeds are mostly small and somewhat flattened, with two narrow wings, one down each side of the seed; rarely (e.g. Actinostrobus) triangular in section with three wings; in some genera (e.g. Glyptostrobus and Libocedrus), one of the wings is significantly larger than the other, and in some others (e.g. Juniperus, Microbiota, Platycladus, and Taxodium) the seed is larger and wingless. The seedlings usually have two cotyledons, but in some species up to six. The pollen cones are more uniform in structure across the family, 1–20 mm long, with the scales again arranged spirally, decussate (opposite) or whorled, depending on the genus; they may be borne singly at the apex of a shoot (most genera), in the leaf axils (Cryptomeria), in dense clusters (Cunninghamia and Juniperus drupacea), or on discrete long pendulous panicle-like shoots (Metasequoia and Taxodium). Cupressaceae is a widely distributed conifer family, with a near-global range in all continents except for Antarctica, stretching from 71°N in arctic Norway (Juniperus communis) south to 55°S in southernmost Chile (Pilgerodendron uviferum), while Juniperus indica reaches 5200 m altitude in Tibet, the highest altitude reported for any woody plant. Most habitats on land are occupied, with the exceptions of polar tundra and tropical lowland rainforest (though several species are important components of temperate rainforests and tropical highland cloud forests); they are also rare in deserts, with only a few species able to tolerate severe drought, notably Cupressus dupreziana in the central Sahara. Despite the wide overall distribution, many genera and species show very restricted relictual distributions, and many are endangered species. A 2010 study of Actinostrobus and Callitris places the three species of Actinostrobus within an expanded Callitris based on analysis of 42 morphological and anatomical characters. Calocedrus decurrens is the main wood used to make wooden pencils and is also used for cupboards and chests. In China, cypress wood known as baimu or bomu, was carved into furniture, using notably Cupressus funebris, and particularly in tropical areas, Fujian cypress and the aromatic wood of Glyptostrobus pensilis. Native Americans and early European explorers used Thuja leaves as a cure for scurvy. Distillation of Fokienia roots produces an essential oil called pemou oil used in medicine and cosmetics. Recent progress on Endophyte Biology in Cupressaceae, by the groups of Jalal Soltani (Bu-Ali Sina University) and Elizabeth Arnold (Arizona University) have revealed prevalent symbioses of endophytes and endofungal bacteria with Cupressaceae family. Furthermore, current and potential uses of Cupressaceous trees's endophytes in agroforesty and medicine is shown by both groups. The pollen of many genera of Cupressaceae is allergenic, causing major hay fever problems in areas where they are abundant, most notably by Cryptomeria japonica (sugi) pollen in Japan. Highly allergenic species of cypress with an OPALS allergy scale rating of 8 or higher include: Taxodium, Cupressus, Callitris, Chamaecyparis, and the males and monoicous variants of Austrocedrus and Widdringtonia. However, the females of some species have a very low potential for causing allergies (an OPALS allergy scale rating of 2 or lower) including Austrocedrus females and Widdringtonia females. ^ Watson, Frank D.; Eckenwalder, James E. (1993). "Cupressaceae". In Flora of North America Editorial Committee (ed.). Flora of North America North of Mexico (FNA). 2. New York and Oxford. Retrieved 6 September 2013 – via eFloras.org, Missouri Botanical Garden, St. Louis, MO & Harvard University Herbaria, Cambridge, MA. ^ Bosma, Hylke F.; Kunzmann, Lutz; Kvaček, Jiří; van Konijnenburg-van Cittert, Johanna H.A. (August 2012). "Revision of the genus Cunninghamites (fossil conifers), with special reference to nomenclature, taxonomy and geological age". Review of Palaeobotany and Palynology. 182: 20–31. doi:10.1016/j.revpalbo.2012.06.004. ^ Qu, X. J.; Jin, J. J.; Chaw, S. M.; Li, D. Z.; Yi, T. S. (2017). "Multiple measures could alleviate long-branch attraction in phylogenomic reconstruction of Cupressoideae (Cupressaceae)". Scientific Reports. 7: 41005. doi:10.1038/srep41005. PMC 5264392. PMID 28120880. (Gadek et al. 2000, Farjon 2005; a more complete phylogeny, based on 10,000 nucleotides of plastid, mitochondrial, and nuclear sequence from 122 species, representing all genera is provided in Mao et al. 2012. ^ Piggin, J.; Bruhl, J.J. (2010). "Phylogeny reconstruction of Callitris Vent. (Cupressaceae) and its allies leads to inclusion of Actinostrobus within Callitris". Australian Systematic Botany. 23 (2): 69–93. doi:10.1071/sb09044. ^ a b "Chinese Furniture Materials: Cypress (Baimu, Bomu) 柏木". Curtis Evarts. Archived from the original on 18 November 2000. citing Evarts, Curtis (1999). C. L. Ma Collection: Traditional Chinese Furniture from the Greater Shanxi Region. Hong Kong: C.L. Ma Furniture. ISBN 978-962-7956-19-8. ^ Thomas, P. & Yang, Y. (2013). "Fokienia hodginsii". The IUCN Red List of Threatened Species. 2013: e.T32351A2815809. doi:10.2305/IUCN.UK.2013-1.RLTS.T32351A2815809.en. Retrieved 23 December 2017. ^ Fu, Liguo; Yu, Yong-fu; Adams, Robert P.; Farjon, Aljos. "Glyptostrobus". Flora of China. 4 – via eFloras.org, Missouri Botanical Garden, St. Louis, MO & Harvard University Herbaria, Cambridge, MA. ^ Weyerstahl, Peter; Marschall, Helga; Phan, Tong Son; Phan, Mhin Giang (1999). "Constituents of Vietnamese pemou oil—a reinvestigation". Flavour and Fragrance Journal. 14 (6): 409–410. doi:10.1002/(SICI)1099-1026(199911/12)14:6<409::AID-FFJ843>3.0.CO;2-B. ^ Lesueur, Dominique; et al. (2006). "Analysis of the root oil of Fokienia hodginsii (Dunn) Henry et Thomas (Cupressaceae) by GC, GC–MS and 13C‐NMR". Flavour and Fragrance Journal. 21 (1): 171–174. doi:10.1002/ffj.1557. ^ Charpin, Denis; et al. (2013). "Cypress pollen allergy". Revue des Maladies Respiratoires. 30 (10): 868–878. doi:10.1016/j.rmr.2013.09.014. PMID 24314710. ^ Krihara (Kurihashi), M. (1997). "Physiochemical and immunological characterization of major allergens of Japanese cedar pollen and false cypress pollen". Allergology (in Japanese). 3: 203–211. ^ a b Ogren, Thomas Leo (2015). The Allergy-Fighting Garden: Stop Asthma and Allergies with Smart Landscaping. Berkeley, California: Ten Speed Press. ISBN 978-1-60774-491-7. ^ Kern, Frank D. (1973). "A host survey of Gymnosporangium". Mycopathologia et Mycologia Applicata. 51 (1): 99–101. doi:10.1007/BF02141290. Soltani, J. (2017) Endophytism in Cupressoideae (Coniferae): A Model in Endophyte Biology and Biotechnology. In: Maheshwari D. (eds) Endophytes: Biology and Biotechnology. pp. 127-143. Sustainable Development and Biodiversity, vol 15. Springer, Cham. Pakvaz, S, Soltani J. (2016) Endohyphal bacteria from fungal endophytes of the Mediterranean cypress (Cupressus sempervirens) exhibit in vitro bioactivity. Forest Pathology, 46: 569-581. Soltani, J., Zaheri Shoja, M., Hamzei, J., Hosseyni-Moghaddam, M.S., Pakvaz, S. (2016) Diversity and bioactivity of endophytic bacterial community of Cupressaceae. Forest Pathology, 46: 353-361. Farjon, A.; Hiep, N. T.; Harder, D. K.; Loc, P. K.; Averyanov, L. (2002). "A new genus and species in the Cupressaceae (Coniferales) from northern Vietnam, Xanthocyparis vietnamensis". Novon. 12 (2): 179–189. doi:10.2307/3392953. JSTOR 3392953.